This is a great tool to use with students who are learning about a new topic. 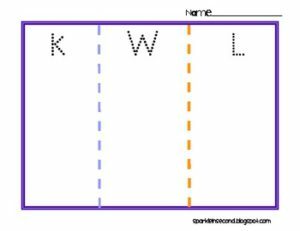 This KWL chart can be used with a variety of topics. The children fill out what they already know about the topic in the K column. Then, the children write down what the want to know about the topic in the W column. Then, when they are done learning about the topic they write down what they have learned. This graphic organizer is a great tool for teachers to verify learning has taken place.